One Call Heating and Cooling handles all forms of service on residential and commercial Goodman products including air conditioners and furnaces. Call us today at (678) 929-1179 or click here to schedule service online. Goodman Manufacturing offers both residential and commercial HVAC units. One Call carries one of the largest HVAC parts inventories in the greater southern Atlanta Georgia area. If the technician doesn’t have the part on the truck it will be delivered after the repairs are authorized. Goodman Mfg. offers both split and packaged AC units for both residential and commercial uses. Commercial packaged units are offered from 3 to 20 tons and split systems for smaller commercial uses. One Call carries one of the largest inventories of air conditioner parts in the southern greater Atlanta area. 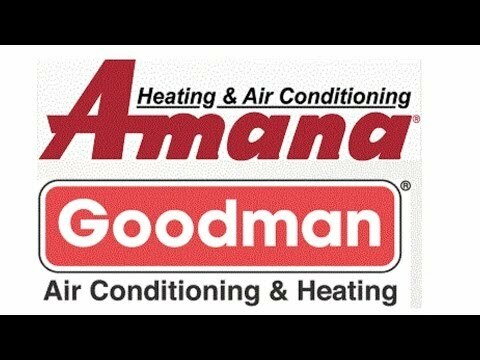 From response and troubleshooting to repairs and tune-up One Call is the HVAC contractor to call for all Goodman air conditioner needs. Call us @ (678) 929-1179 orschedule service online here. Goodman heat pumps are a favorite in the greater Atlanta Georgia area because of the milder winters. The energy efficiency of heat pumps means you can rack up the savings over the life of the system. Goodman heat pumps combined with proper insulation will ensure your indoor comfort and up to 40% savings on your utilities. Electric heat kits are available that will only kick in during the coldest nights to provide the peace of mind if you feel it may be necessary.ered after the repairs are authorized. The Goodman air handler is the indoor portion of your split HVAC system with the heat pump being the outdoor portion. It is the job of your Goodman air handler to economically and quietly deliver the cooled or heated air to the ducts that deliver it. Having the right heat pump with the right air handler feeding the right size ducts all delivering air to the properly insulated home is the key to reaching that 40% savings over the life of your new Goodman system. One Call is the experts at designing and installing that custom system in your properly insulated home. Goodman Manufacturing offers both residential and commercial gas furnaces. Goodman’s variable speed and multi-speed furnaces provide energy efficiency by ramping up to respond to the thermostat. Efficiency and prices of Goodman furnaces is one of the main selling points. One Call is the HVAC contractor to call for all Goodman air conditioner needs. Call us @ (678) 929-1179 or schedule service online here. One Call carries one of the largest inventories of gas furnace parts and electric heat kit parts in the southern greater Atlanta area. From response and troubleshooting to repairs and tune-ups One Call knows more about Goodman furnaces. Goodman also offers a full line of indoor air quality products including: air filtration, UV purifiers, ventilators and humidifiers for families that have special needs. Ask your Goodman specialist from One Call Heating and Cooling for more information. Goodman offers a full line of controls and both: programmable and non- programmable thermostats. If having a remote controlled system sounds good to you call us @ (678) 929-1179 or schedule service online here and ask about the CTK03 control. Goodman mini-split systems are ideal for places that traditional duct systems just won’t work. Mini-splits are economical to install and provide cooling and heating with the convenience of a remote control. And best of all, turn the system off when you leave to save money on energy bills.